The dodo is a familiar bird for anyone who has read Alice In Wonderland — a plump bird, with small wings and a blunt beak presenting Alice with a prize. This representation of the dodo comes closest to common perception of the extinct bird. But what if this were to be replaced by a sight of the actual bird itself? This could soon be the case, for, led by Dr Alan Cooper of the University of Oxford, a team of scientists is trying to recreate the dodo through cloning. Known to be a large, ungainly bird that couldn’t fly, dodos lived in the island of Mauritius for millions of years. The island was paradise for the birds, as there were no predators and a cornucopia of fruit could be found at the ground level. With no need to escape predators or to pluck fruit off high trees, the birds shed their flying abilities and metamorphosed into plump creatures that stored large amounts of fat that would tide them over periods of scarcity. When Dutch settlers came to Mauritius in the 16th century, the dodos’ inability to fly, coupled with their total fearlessness towards the humans, spelt disaster for them. They were easy prey for the humans and soon hunted down. In addition, pigs, rats and monkeys, too, destroyed the dodo’s habitat. First sighted around 1600, the dodo was extinct less than 80 years later. The last dodo died in 1681. No complete specimens of dodo are preserved, although a number of museums are home to dodo skeletons. 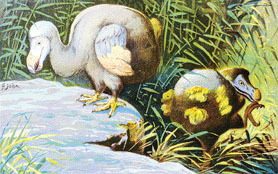 A dodo egg is on display at the East London Museum in South Africa. The only known major remains of the dodo are in the Oxford University Museum of Natural History. Even here, in the January of 1775, an inspector from the Oxford Museum discovered the only remaining dodo, stuffed and disintegrating, and decided to throw it away. The man in charge of this task saved the head and a foot, that were in good condition, and this is all we have of the dodo bird today. Fortunately for scientists at Oxford, these remains of the dodo in the museum’s possession have some soft tissue left which can provide them with some much-needed genetic material. "The DNA survives," Dr Alan Cooper, told the BBC. "It’s very damaged and broken down into tiny pieces, but little fragments remain in the cells preserved in the old specimen." Dr Cooper also found out that, based on the few skeletons, that the dodo was a much sleeker bird, than the usual "fat" dodos portrayed by 17th century Dutch painters. The scientists will clone the bird by identifying its distinctive genes, creating genetically engineered DNA and inserting it into a nucleus of an egg that would then hatch a bird resembling the dodo. But this also questions the morality and ethics of cloning extinct organisms. The first question — is a genetically recreated dodo actually a dodo? Comprising mainly genetic strains from similar birds, the clone would be simply a trans-species clone, making it another bird remarkably similar to the dodo, but not a dodo. The dodo appears to have reproduced slowly, and this normally goes hand-in-hand with caring for the young for a time after hatching in order to teach them how to find food, behave, sing etc. This is something that many birds of prey do, for instance. In the case of a newly cloned dodo, there’s no adult bird to copy behaviour off.